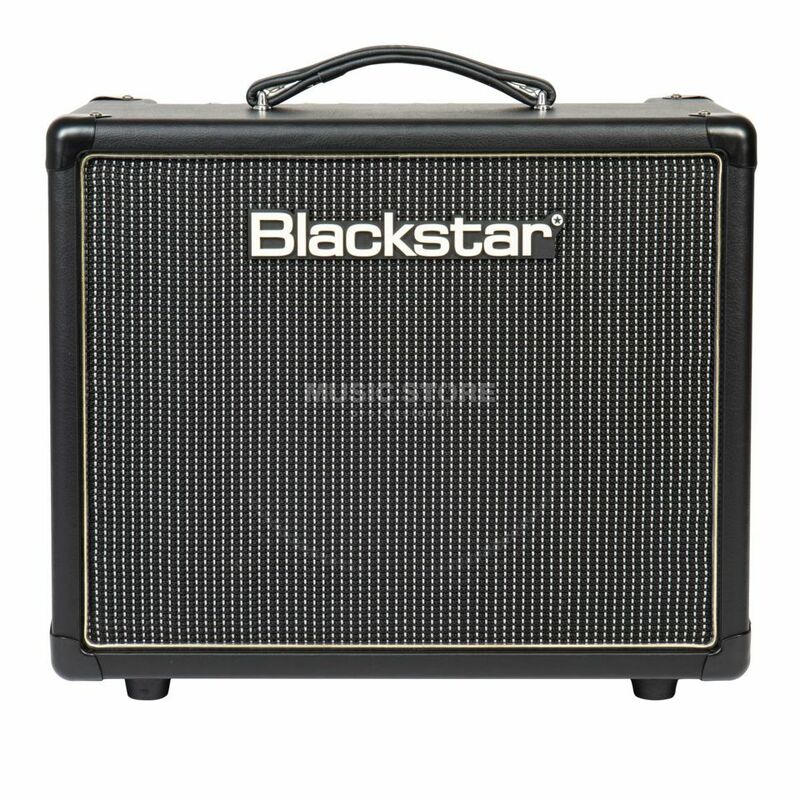 The Blackstar HT-5R Combo Amplifier is a 5W combo amplifier with 2x channels, designed for use with Electric Guitars. The tones of this amp rely on ECC83/12AX7A valves at the pre-amplifier stage and a double triode 12BH7 in the power amplifier, and give the HT-5R rich sounds that are reproduced with the Blackstar Blackbird 50 12" speaker. 2x foot-switchable channels (switches included) offer a lot of sound options. The clean sound sounds warm, round and leaves nothing to be desired. ISF technology enables tone shaping and is available in addition to the classic 3-band tone control, ranging from wider American sounds to a straight British character. A reverb effect is included and enriches the sound with spatial depth. For a modern Guitar amp, there's also a serial effect loop that lets you choose between pedals and studio effect devices (+4dBV/-10dBV). In addition, a line input is available for playback via smartphone (among others). The emulated output for recording or headphone operation is frequency-corrected. The voicing offers either 1x 12" or 4x 12" characters. Outputs: USB Audio & XLR D.I. Hard to find the words how much I live this amp. Massive rock, vintage blues, nice cleans, smooth reverb - in one amp! I saved money with this beauty, because I dont need to buy overdrive and reverb pedal, the built in ones are perfect! Ideal for home practice, and have the opportunity to pump up with cabs. I was concerning a HT-1R, but it had no effects loop and 8 inch speaker wasn’t what I wanted. So after watching a tons of youtube video reviews I’ve ordered HT-5R from Musicstore. The unit arrived, so I plugged it in, and… my neighbor’s quite life was over. This black box is damn loud when playing overdrive! Even if you have your dirty channel gain set to 10 o’clock and volume to 8 or 9, it will bring you that sparkling tube overdriven sound, but still it will be too loud if you’re living in apartment with a neighbors all around. However, if you’re using clean channel or clean channel with an external overdrive you can get the decent volume levels. Nevertheless, 90% of time I’m practicing with a headphones. Speaking about a built-in emulated output, I have to admit, it is not high quality. It’s OK for cleans, but when playing with an overdrive it sounds thin and compressed as it lacks some low end freq. To overcome this you can use an EQ pedal in FX loop to boost low frequencies, or (as I did) take a signal from “send” channel of FX loop to you DI and run Bias FX (or Guitar Rig or whatever) with a cleanish amp and cab. This way you’ll have a real tube preamp with a digital emulated power section and cabinet, plus you can add various effects, and it sounds pretty good. Talking about the amp sound, I can say that I got what I wanted. The clean channel is very good. I'm using it with a strat, and add some boost and reverb getting a very nice sparkling sound. Plus you can add an overdrive pedal in front of it. For instance, I’m using a tc electronics MojoMojo overdrive pedal for smooth bluesy sound, and it sounds very good. But dirty channel is where this amp shines. Using ISF feature you can easily get Brit-like rich overdrive for a classic rock sound, or turning the ISF knob to USA side, you’d get a MESA-like sound with scooped mids which is very good for metal. But a real sonic bliss would come if crank you amp out loud. With a volume set to 3 o’clock and overdrive at noon it will start to overload the power section and the speaker would start to move the air delivering a great dynamics and punch. So, summing up. This amp is a great peace of gear, especially if you have place to unleash its sound energy, well packed with useful features (FX loop and Reverb are very handy), and more it is reasonably priced. Of course it’s not suitable for live gigs on big venues, but if you practice at home or gig in a small club it will do its job.